Given the rising prevalence of diabetes across the globe, self-monitoring blood glucose devices market has been witnessing remarkable growth in the past few years. The rapid technological advances in the blood glucose monitoring solutions have further impelled the industry share, which was pegged at a massive valuation of USD 14.3 billion in 2017. If reports are to be believed, the rising rate of obesity and rising geriatric population worldwide has served to be an important factor propelling the demand for self-monitoring blood glucose devices. According to the World Health Organization, the number of people suffering from diabetes has climbed from 108 million as recorded in 1980 to a significant 422 million in 2014. The statistics further claim that the global prevalence of diabetes has surged among adults over the 18 years of age from a mere 4.7% in 1980 to almost double until 2014. In fact, in 2016, the WHO estimated diabetes as the seventh leading cause of death across the globe, given the record of 1.6 million deaths directly because of the disorder. Not so surprisingly, these aforementioned statistics stands as a substantiation to the fact that diabetes is one deadly disorder that needs continuous blood sugar checking & monitoring, which in turn will be stimulating the global self-monitoring blood glucose devices industry share. It has been further reported by WHO that diabetes prevalence has been more prominent in the low and middle income economies because of the certain lifestyle patterns, increasing consumption of tobacco & alcohol, and other environmental factors. In India, for instances, estimates reported over in 2016, 7.9% of total female population and more than 7.5% of male population had diabetes. Despite the high rate of diabetes prevalence, reports claim that the rapid developments in healthcare infrastructure, growing adoption of advanced products, and substantial surge in disposable income levels will stimulate self-monitoring blood glucose devices industry expansion. Other Asia Pacific countries including China, Korea, and the Indian-subcontinents are also expected to follow similar growth trends. 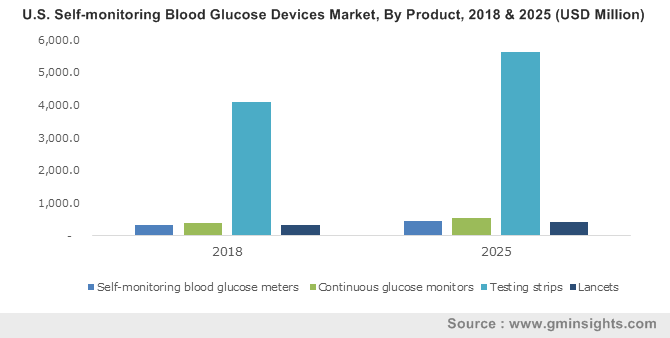 Given this regional expansion, the Asia Pacific self-monitoring blood glucose devices market is projected to register a healthy CAGR of 6.1% over 2018-2024. Speaking along the similar lines of the geographical expansion of this business space, North America SMBG devices industry, with U.S. at its forefront, has emerged as a lucrative investment ground, grabbing a total of 39.1% in the global revenue share of 2017. Sedentary lifestyles and increasing rate of obesity due to unhealthy dietary patterns have further lead to increasing diabetes prevalence in this region. As per the statistics provided by the CDC, nearly 35.7% young population aged in between 20–39 years, 42.8% adults between the age of 40-59 years, and 41% of the geriatric people aged 60 and above suffered from obesity in 2016. Reports in fact claim that, accounting for more than 34.2% revenue share in 2017, U.S. self-monitoring blood glucose devices market dominated the industry. The product demand is further likely to gain traction because of the growing awareness among the local population, supportive governmental initiatives and schemes, and advanced healthcare infrastructure. Elaborating further on the surging product demand, SMBG devices are proving to be of paramount importance to diabetes patients, given the ease of operation and accuracy of measurement. The prominent industry players are further expected to bring about transformative changes with product innovation and market growth strategies. Recently for instance, Abbott FreeStyle Libre, an American healthcare giant, has launched its FDA approved personal glucose sensor that diabetic patients can wear for nearly 10-day and 14- day time period, in turn allowing patients with diabetes to monitor glucose reading on their smartphones with real-time data and glucose level information. Such product innovation trends adopted by other industry players such as Dexcom, F. Hoffmann-La Roche, Nova Biomedical, Abbott Laboratories, LifeScan, Trividia Health, Johnson & Johnson, Nova Biomedical, and Medtronic are further likely to aid the growth of the self-monitoring blood glucose devices market in the ensuing years. A report compiled by Global Market Insights, Inc., claims the overall SMBG devices industry valuation to surpass USD 20 billion by 2024, with an estimated CAGR of 5.1% over 2018-2024.